Becoming a home owner is one of the biggest accomplishments one can have in their life. Whether it’s purchasing an old home, a new home, or even having one built, nothing quite says “success” like adding a house to your list of possessions. Of course, that brings in a whole new list of responsibilities, too, if you want to keep your house in tip-top shape. One of the more enjoyable things about owning a home is furnishing it. However, before you can do that, you have to make sure that the walls and floors are in good condition, especially when it comes to mold or stains. Walls are difficult to replace, but flooring is one of the more modular things that you can change. If you have a wooden floor, then you don’t have much to worry about. Carpet, however, is a completely different beast. Carpet can be soft, luscious, and comfortable. It can also be beautiful, but it is somewhat difficult to keep up to that standard. 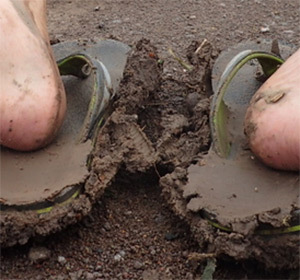 It can easily get dirty and accidents will happen. Fortunately, there are multiple ways to spot-clean carpet before having to call out a professional cleaner. Let’s face the truth: those store-bought carpet cleaning machines don’t do work well enough. All is not lost, however. There are special ways to get any liquid (or solid) out of a carpet if you get to it quickly enough. You don’t have to call a professional for smaller things, but eventually, it will likely be a must. 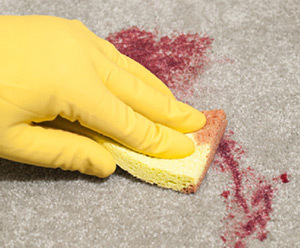 Stains can happen just as easily on carpet as they do on clothes or bed sheets. Act immediately and don’t panic! While it might be obvious to most, there’s actually a lot more to it than just “flooring”. Knowing about the material can help you save it whenever you’re trying to clean it up. Carpet can come in different types, but there are only a few popular ones that grace people’s floors. However, at its core, it is a pile attached to a backing. A pile is a raised surface or nap of a fabric. These fabrics come in all shapes and sizes. It must extend through the entirety of the room and be tacked down to be considered “carpet”. If it doesn’t, it is considered a “rug”, which is a completely different ballgame. Then again, a woven, hand-made rug can also be considered a carpet. We’ll be focusing on the ones that span the entirety of the room, but feel free to use these techniques on your material. 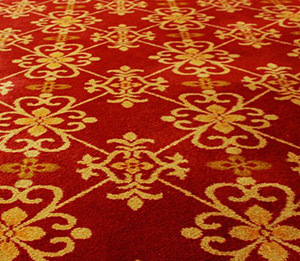 Most carpets are made out of certain fabrics and each one could have a more effective cleaning method. Each one of these is different, but for the most part, cleaning can be done through any of these materials. While an old form of carpeting, it is constantly changing over the years. Before, this material pilled a lot, creating small, concentrated balls of material. These are extremely uncomfortable, so carpet makers began to look for a way to diminish this. While it still happens sometimes, over the years, they have been able to decrease the amount of pilling. It is highly stain resistant, but is difficult to dye as well. To the touch, it feels like wool. 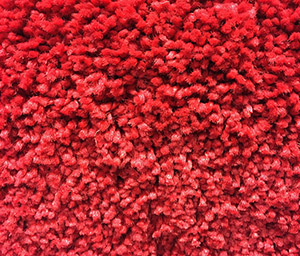 Over the past few decades, nylon carpeting has become more and more popular for commercial sites. They are cost-effective in the sense that it is cheap to produce and easy to take care of. They are also resistant to wear. However, they also stain the easiest since they have dye sites, which need to be filled to give it any stain resistance at all. This is a carpet yarn that is relatively inexpensive as well. It is used in many high-traffic areas like offices or hotels. It is relatively wear-resistant and doesn’t stain easily, but are very susceptible to oil-based liquids. If the stain sets, it’s hard to get out. This material is relatively new to the carpeting world, produced in the 90’s. Over the past couple of decades, the price has rose to make it competitive and proceeds to be growing in popularity. It does, however, mat easily and crush down, which is difficult to restore at times. It is often used for mid to low-priced carpeting. While highly durable and very wear-resistant, wool is likely the most easy-to-stain material. It can be combined with other materials, increasing durability and stain resistance, but wool is relatively expensive and one of the most comfortable. It can be difficult to find, making up a small portion of the carpet market. Carpet is difficult to keep clean sometimes, especially if you have a bigger family. You may not realize it, but you can walk thousands and thousands of steps in your house every day. This may not be entirely on your carpet, but if you add a few family members and maybe even pets, your carpet will be used quite a bit. These aren’t the only things, of course, but they’re common enough that it could happen at any time. Carpet is easily ruined by stains or damaging liquids, so be sure to pay attention to what goes on or around it. 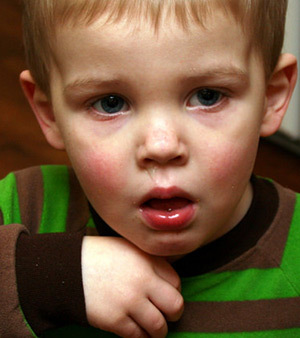 It can be sometimes difficult, especially if you have kids or pets. They may not understand the trouble you’d go through if something happened to your carpet. Regardless, each of these things can be removed from the carpet if you find it early enough and quickly enough. Don’t panic, as said above. Do what you can to get as much of it up as you can before tossing yourself to the professionals. Most of these can be spot-cleaned, so do what you can to save your carpet before it stains. The number one thing to keep in mind when there is a stain or offending liquid in your carpet: never rub them to get them out. This goes for stains in any sort of fabric, though. Whether it’s carpet, clothes, or bed sheets, you should never push down and rub the stain around. Not only will this ruin the fibers of your carpet, it will push the staining matter around into the other fibers. The best way to get any liquid from any material up is to blot it with cleaning agents. Vinegar (especially white) can get a lot of the liquids and stains up from most carpets, but each of the stain sources listed above can be separated into water-soluble or other soluble. Anything that’s water-soluble will usually be removed by water or water mixtures. If it’s a different soluble, you may need something special. These stains will most likely be lifted from water mixed with a non-bleaching agent like white vinegar or a laundry detergent. Using about 3/4th part water and 1/4th part of the cleaning agent should be fine. The non-water soluble stains are a bit more difficult to get out, but it’s still possible to spot-clean them. Each one has its own special method as discussed in the next section. 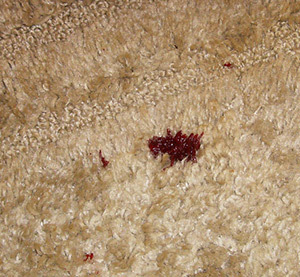 If you or someone else has accidentally injured themselves, there’s quite a large possibility that a bit of blood may drop on your carpet. Blood’s natural remover and purifier is hydrogen peroxide. After getting what you can up with the water and detergent or white vinegar mix, scrape what you can off the carpet fibers. Afterward, pour only a little bit of the hydrogen peroxide onto the stain, where it will foam and break up the remaining blood further. After it is finished foaming, simply dab the blood out and let the carpet dry from the moisture that was applied to it. After you’re certain that all of the blood has been removed, feel free to press a towel into the moist spot. Unfortunately, we get sick sometimes. Other times, we may have a bit too much to drink. Either way, any of these things, from a child or not, can cause a pretty gross accident. If left too long, it can also cause a foul-smelling stain for times to come. However, if you act quickly enough, you can get the pungent mess up without harm. When the accident happens, get as much of it up as you can. Dab the offending liquids with a damp paper towel or cloth. Remember, don’t push it deeper by scrubbing! Afterward, get an enzyme-based cleaner, similar to those that you would clean up pet messes with. After applying generously to the affected area, let it sit and then wipe it up. If it doesn’t lift very much, repeat as many times as necessary. 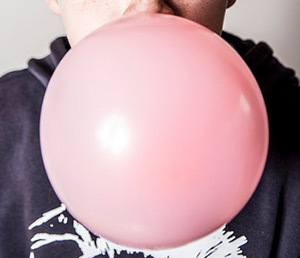 Whether you track it inside from outside or kids may accidentally drop it, gum can be pretty scary to get in your carpet. Don’t fret, though! Gum is relatively easy to get out if you do it correctly. Get a bag of ice, whether Ziplock or not, and place it on the gum. This will cause the soft gum to harden, making it easy to scrape up. Be careful when doing this, however. Since the gum is stuck to the fibers of your carpet, it is easy to damage them by tugging the gum from the carpet. Light scrapes can get a good amount of it off, and then afterward, a simple cleaning mixture can get the sugar or food dye out of the carpet. 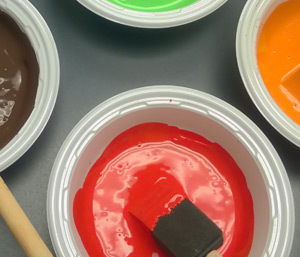 Paint is a bit trickier than other stains, considering it is made up of chemicals that are made to stick. However, depending on the paint, most of it can be pulled from the carpet. A normal water mixture with white vinegar or detergent can get up most water-based paints, but if it’s an oil one, you may have to get a steamer or resort to professionals. Using the steam machine, apply it directly to the spot in the carpet for a little while. After the steam gets in deep, use a needle or some sharp object to pick the paint from the carpet fibers. This can be a grueling task that takes a while, so you may need to use the steam machine again before you’re finished. Afterward, a simple matter of detergent and water should get the rest out of the fibers. These are a bit trickier and have plagued many families for decades. 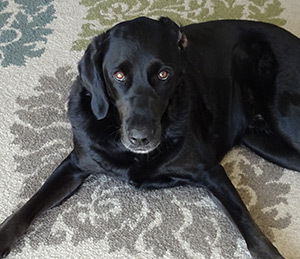 Even the most well-trained and well-behaved pet can have an accident on the carpet. While training is a whole different subject, we’re here to help you get those yellow or brown stains up from your floor. For this, however, it’s a bit more complicated. Pets have designated areas to relieve themselves, so they may have repeat offenses if not taken care of thoroughly. Urine and feces leave a chemical scent that tells the pet that it’s the place to go. Removing this scent may be difficult, but there are special cleaners, both organic and inorganic, to assist in removing it. If you have access to a steam machine, it’s a good thing to use pretty often. While it’s not as good as a pure professional cleaning, it can help in the long run. Carpets can get full of dust, allergens, and pet dander often. Mold has the possibility to grow beneath if dampened. Keeping them deep cleaned with steam will make your carpets last a lot longer between professional cleaning. However, while steam cleaning is good for a carpet, many store-bought machines will not give your carpet the cleaning it needs. Eventually, all carpet will require a thorough cleaning by a professional. There’s no way around it if you want to keep your flooring looking as perfect as it can be. Steam clean when you can, but don’t substitute it for a professional cleaning. As said above, there is no way around getting a professional cleaning done of your floors. Depending on the size of your room or multiple rooms, you won’t have to sacrifice a massive amount. The national average for carpet cleaning is usually less than $200, but the high-end of it can be anywhere from around $300-500. It is recommended to get your carpets professionally cleaned once a year to extend the longevity of your flooring. That may seem a bit too often for some, but if you deep clean enough, you can extend that to two or even three years apart. There’s nothing wrong with getting your carpet cleaned more often, though. While carpeting can be a tough job to take care of, it can be some of the most beautiful and comfortable flooring around. It’s a lot more comfortable and warm than floor or tile, that’s for sure. With carpeting comes a bit more responsibility, though. Stains can happen in the fraction of a second if you’re not careful. Careless people can ruin their carpet in a week! There are many other stains that can affect your carpets, though. Most of them can be removed with a bit of water and white vinegar or detergent. Never try to scrub it out unless the cleaner you’re using tells you to. Always dab the cleaning cloth inward instead of outward to avoid spreading the offending liquid or stain-causing matter. Don’t panic and take care of what you can. When all else fails, call a professional!